2) Hang your bee house outside, 3-6 feet off the ground facing southeast to receive morning sun. Run a screw through the back of the house to mount. 3) Make sure the house is stable & supported on a sturdy post or wall. Nesting holes come in different sizes and types. Be sure to only use natural material. Never use drilled blocks of wood, as it encourages harmful pests and disease with native bees. 2) The nesting reeds & blocks should be approximately 1” from the inside of the front edge of the house to ensure shelter from wind & rain. 3) Make sure the reeds & blocks are stable and won’t move around. You may wish to tie a rubber band around your reeds. 4) Place the reeds around your wood nesting block. The reeds may also go in the attic of the bee shelter. However, you will need to place your Release Box in the Attic first, then place the reeds around it. 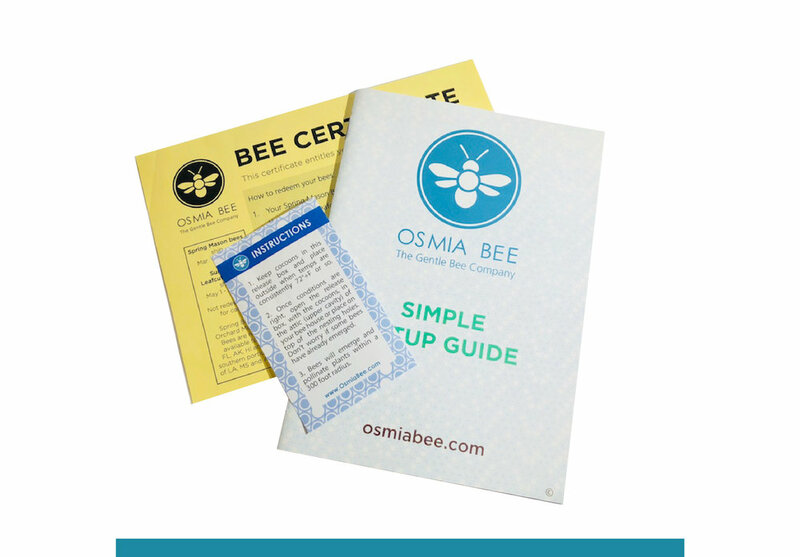 If you received a bee voucher, please to to Redeem Bees to pick a shipment date that is suited to the mason or leafcutter bee’s temperature preference. Bees won’t fly until the temperature is right–make sure to follow the below section on how to release your bees from the Release Box. 1) Leafcutter bees use supple leaves they cut with their mandibles (jaw) to build their nesting chambers (egg compartments within the nesting holes). Providing a variety of soft leafy plants is important for the bees. Your leafcutter bees were laid by last year’s bees. The bee larvae hibernate over winter. Then when temps reach 70˚F to 80˚F the bees will start to develop over the next 4 weeks. Please be patient during this time. 2) Once your house and habitat are set up, you’ve received your bees in the mail from the bee voucher, and the temperatures are warm enough, the fun can begin! 3) Keep the cocoons inside the Release Box that they arrived in, ensure there is an opening large enough for the bees to emerge from their cocoons. 4) When the outside temperatures are right (~72˚F+ ), place the box with cocoons in the attic of the bee house, or simply place it above the nesting reeds or blocks. 5) Most leafcutter bees will emerge within a week or so after being placed in adequate temperatures outside, but don’t be surprised if some take longer to emerge. 6) Once the bees have started working, enjoy the observation room on the side of the bee house to see the work the female leafcutter bees have completed inside the nest. 1) On the same day your bees arrive in the mail, remove the top lid of the release box carefully to not damage the bee cocoons inside. 2) Close the box and match the three top holes with the three bottom holes. 3) Place the release box (closed with holes matching) in the attic of your bee shelter (Diagram above). Remember, weather should have temperatures around ~72˚F+. 4) You may wish to have your reeds placed in and around the release box in the attic of the bee shelter. 4) The release box will protect your bees from weather and predators. The release box holes allow your bees to emerge out of their cocoons safety and protected from the elements. Remove the nesting block from your bee house and place it inside your blue bee care bag along with any filled reeds. Store your reeds and nesting block in a safe place away from predators, like a garage or shed that is not temperature controlled.